The beloved science teacher at JKF Middle School has been found dead in her classroom and YOUR Junior Crime Detectives are on the case. 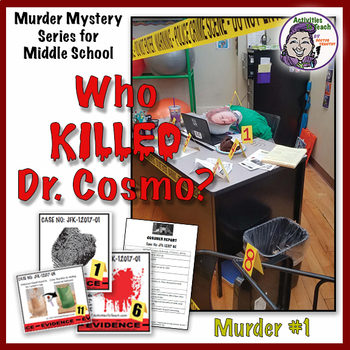 Using their skills critical thinking skills, deductive reasoning, and team work, the Junior Crime Detectives work in partnerships or teams to solve the murder mystery. 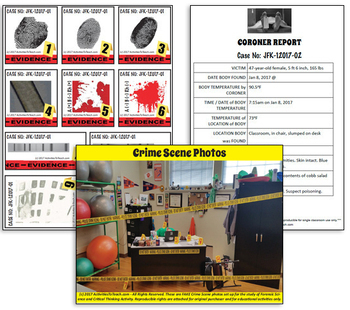 Everything you need for your Junior Detectives is included in this kit including 6 DIFFERENT case files with 6 DIFFERENT guilty suspects for the SAME murder scenario. Each case file has it's own set of evidence that works with the Victim and 6 Suspect files. 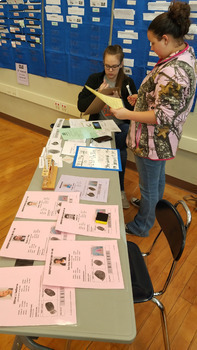 The 6 cases files focus on the same murder scenario, same victim, same suspects, and use the same crime scene photos. The differences in the cases files include: times of death, cause of death (poisoning or exsagniation), test results from lab, DNA fingerprint card, and which suspect is guilty. 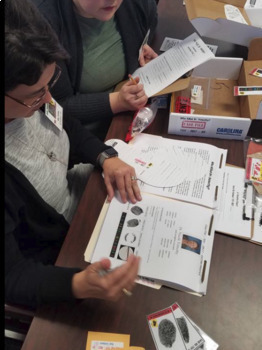 This activity for 1 murder scenario with 6 case files that vary to keep students from copying other's work, helps if a student blurts out info that could "give it away", or to use with different classes. + Case File Evidence - 1 to 12 pcs. required. 13th piece optional. A2T is not responsible if edits or changes are made and murderer is not able to be identified or answer keys do not match. Please remember to respect copyright. Editable documents are not provided to for creating new murders or scenarios. Editable documents are provided for teachers who wish to change names of suspect, school, etc.